lostpastremembered: St Patrick, Gold and the best Medieval Beef Stew you ever tasted! 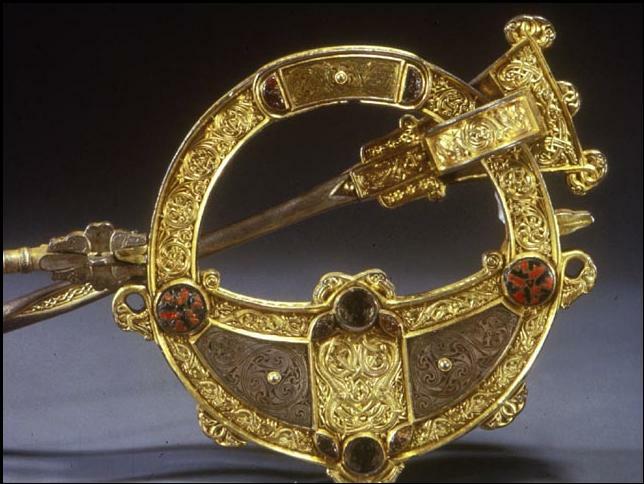 St Patrick, Gold and the best Medieval Beef Stew you ever tasted! 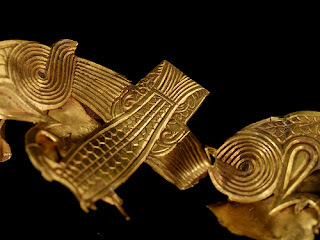 When I think of St Patrick (387-493), I always think of Irish myth, not Christian martyrs –– lots of green, the little people and their pots of gold –– gorgeous, gorgeous gold. 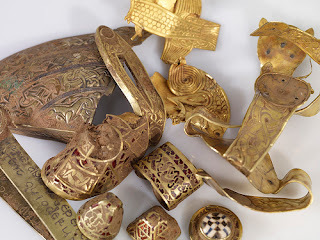 A few years ago in a farmer’s field in Staffordshire England, a very lucky man with a metal detector came upon what has come to be known as The Staffordshire Hoard –– the largest collection of early Medieval gold ever found in England –– 11 pounds of gold made with a staggering level of craftsmanship and art (as a former jewelry maker, I can’t imagine how they did it with the tools at hand). 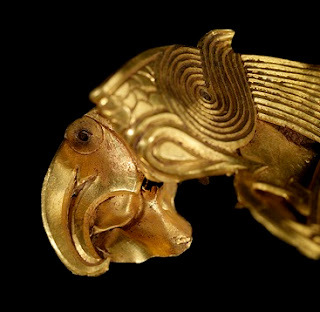 Escaping marauders (or rightful owners escaping capture) buried their treasure (mostly implements of war) –– but never came back to claim it. So it waited for the light for 1400 years. The Migration Period (300-900AD) saw the blossoming of remarkable workmanship all over the Island amongst the Anglo-Saxons and the Celts – had they learned the skill at the hands of their Roman lords or Viking conquerers? The Hoard gold is perhaps not quite as intricate as the Hiberno-Saxon Tara brooch from Ireland (oh those crafty leprechauns), but it is vital and complex work and put me in a medieval state of mind. When I look at these wonders it made me think (no surprise), how could a people that created these miracles of art and craftsmanship not make wonderful food? I felt I must be remembering my history wrong… too much Monty Python on the brain??? China, Japan, India and the Middle East enjoyed a high level of sophistication during this period (so did the Mayans, for that matter). 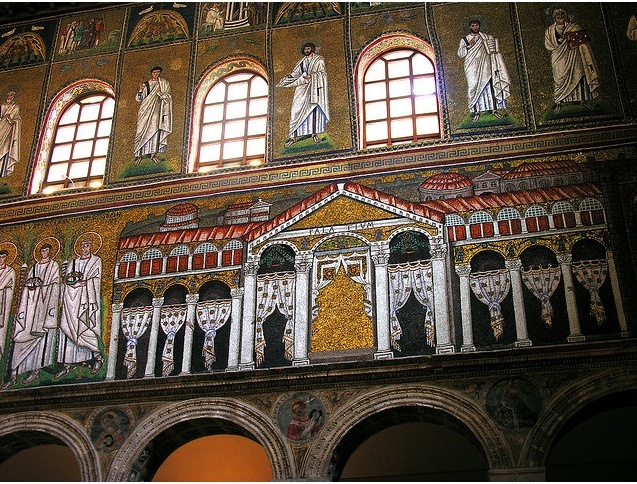 Even in the neighboring kingdom of the Ostragoth Theodoric the Great they were living large in Ravenna, with the potent force of Roman science and culture still pulsing through their lives and architecture. But the early Middle Ages in the British Isles were all about rough clothes, rough men, 30-year life expectancy and subsistence eating –– rocks and berries and tree bark, right? Where are their buildings, their palaces? MFK Fisher said during the Dark Ages, "Food was only a necessity again, like sleep and sweating." The Romans left England around 410 and soon farmland returned to a nearly feral state. The vast wheat fields and crop rotation were gone and soon forgotten (the British Isles had been Rome’s breadbasket) when the Roman overlords withdrew –– the skills were slow to return. Wouldn’t you know it, soon after they’d seen the last of the Romans, the Plague of Justinian devastated Europe and the British Isles in the 6th and 7th centuries and the population of England went from 5 million to 1 million. The forests reclaimed the cultivated land. With this transformation came increased game and pigs -- in fact, Cambridge historian, Debby Banham said forest size was determined by how many pigs could thrive under its leafy canopy and that oak trees “might be measured according to the number of pigs they would feed” (then as now with the famous Spanish Iberico ham, acorns are great pig food). Barley and oats regained primacy as the principal grains of the land until around the first millennium when wheat bounced back. Could it be the real gold in “This other Eden, demi-paradise” was in its verdant, vibrant diversity? The fields and forests were full of nuts, berries, fruits and herbs as well as grains like oats and barley. It was a rich place even if the evaporation of the Roman expertise in farming left the populace in dire straights from time to time. Crops failed often. In a horrible way, the Plague of Justinian made life much better for those who remained –– until the Normans came at least –– there was a lot more to go around. Although there is precious little remaining to tell us what they ate in the early Middle Ages… there are clues in medical manuscripts of all places. These precious documents point to a wonderful cuisine (sorry MFK) in emerging cultures but scholars, like Debby Banham, think this forward movement may have been slow in coming to Britain, there is at least no record of it. I had to cast my net a little further afield to have a taste of the times. I was determined to eat medievally to honor a medieval saint. For my St Patrick’s Day meal, I am combining recipes from the continent and Ireland. It is believed the medieval gold of the hoard covers 600-900 AD. The suggestion for the beef recipe comes from Anthimus (511-34AD) who wrote of it in his 6th century in De obseruatione ciborum . He was a Byzantine physician who was sent by the emperor in Constantinople to the court of the Ostrogoth king, Theodoric the Great (454-526AD). You can see from the Palace picture (and that was only an outbuilding) that it was not an uncivilized backwater. It was considered the first French cookbook (the Ostragoths cut a wide swath covering Italy and part of France minus Burgundy), well, sort of cookbook. I found out about him reading British Food: An Extraordinary Thousand Years of History by Colin Spencer -- the minute I read the description of this beef dish I wanted to make it. If you like sweet and sour (like sauerbraten) you will love this. This beef stew is a medieval treat that moves into the modern world with ease and grace. I tried to honor the ingredients that would have been available at the time as best I could. I had Italian Forest Honey on hand (you know this kind of splurge purchase we all do from time to time) well you will be amazed at how delicious it is –– dark and rich and full of the flavors of the Forest that the bees called home. If you can’t get it, any good honey with personality would work. 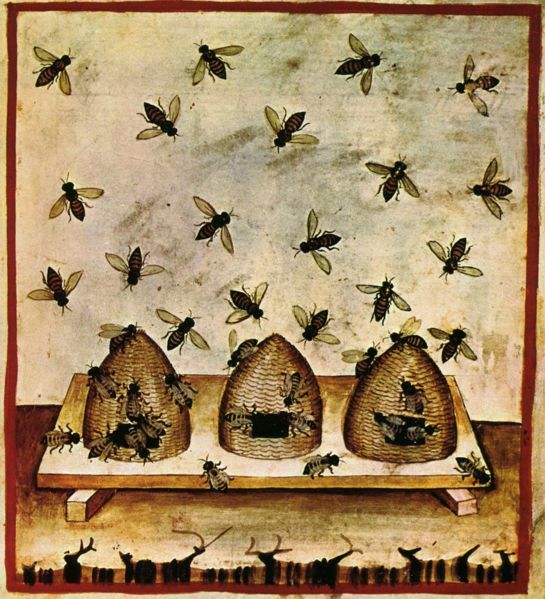 Medieval scholar Banham said organized beekeeping wasn’t happening just yet in the early Middle Ages in England (although the Greeks had been doing it since pre-history). 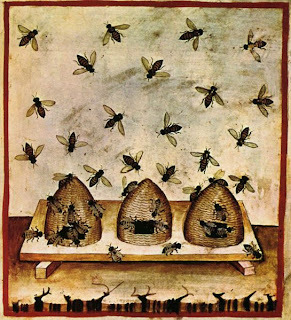 Perhaps they got honey the old fashioned way –– like bears –– from hives secreted in trees?? It didn’t make for a huge supply, so as in all special things, most of it went to the lords of the land for their food and their mead (a honey liquor). Did you know that honey is like wine –– it has terroir in that it tastes like its environment? Sadly, Mr. Honeybear is often filled with honey made by bees that have been fed corn syrup instead of drinking nectar as they should. If you’ve never tried single source honey –– you should just to see the difference, it’s worth the $12 or so bucks. Wine would have only been taken by the Lords (the lower classes drank ale) and was probably French since a chilling climate in England made for bad vine growing conditions until a warming at the end of the millennium, even then the English were not big wine makers. Wine was stored in barrels and jars (amphorae). The Roman bottle had not caught on in the outposts of the Empire as it receded (glass was still rare). The world’s oldest wine bottle and its contents were discovered in Germany and examination revealed that oil was floated on top of the wine to keep it from spoiling – it turned to vinegar very quickly, which might be why vinegar is ubiquitous in early cuisine (and perhaps salad dressing came from dumping out the winey/vinagery oil at the top?). As for spices –– the Catholic church and the Romans brought new tastes to England and Ireland –– it’s hard to say what the natives would have had or kept a taste for after the Romans left ––so far they aren't telling. 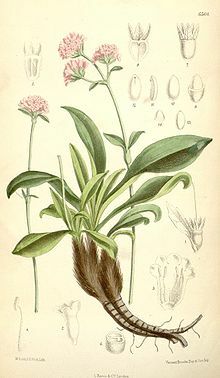 I do wish I could have used costmary. It is part of the chrysanthemum family but was often called ‘scented salvia’ so I used sage since that would be closest in flavor –– although costmary itself is really a beautiful herb –– more delicate and complex than the strong sage. Grows beautifully in the garden and you can get it HERE. 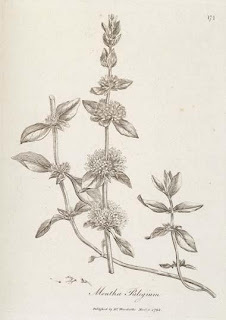 I have tasted pennyroyal –– it is a sweet, childlike mint so mint or catnip would be a good substitute. Should you have it in your garden and want to use it, remember never feed it to a pregnant woman and don’t eat too much of it. The flavors of the dish reminded me of Hippocras, an ancient spiced wine that I made a while ago. 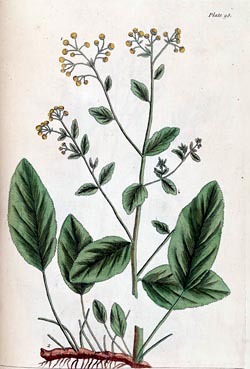 Although the earliest English recipe for the drink is in the Forme of Cury (1390), written over 800 years after Anthimus wrote about this dish, spiced wines were popular with the Romans and their great epicurean collection Apicius, de re Coquinaria has a recipe for a spiced wine with many of the same spices that you find in hippocras and this dish. It is not hard to imagine that only a few hundred years after the Romans had left that spiced wines would still be drunk and used for cooking. Would you throw out something delicious just because it was Roman? Although this specific dish is European –– it isn’t that far-fetched to think the English were doing something a little like it. Even with the decline of the Roman Empire, the new Empire of the Catholic church was covering the old world with its influence as surely as the interwoven tendrils of their art covered their gold and vellum illuminations (and preserved English/Irish mythology that would have been lost without monks writing it down). I’ve also included an Irish recipe with roots in the 6th century, Brochan Fotchep. It was a favorite of an Irish Saint, St. Columkille (521-97). Those of you who are attached to rice and wheat as your starch may change your minds. Today it is more of a soup –– but it began as a creamy porridge –– start thinking very creamy risotto to get yourself in the right mindset. Brown the beef in the fat. Remove and add the fennel, celery and leeks into the fat. Saute for a few minutes. Add the wine, vinegar, honey and spices and return the meat to the pot, cover. Put into a 275º oven for 3 hours. Cook the oats in the milk and stock for ½ an hour at low heat till tender. Saute the leeks until tender in the butter... or go a little farther till they are crisp… I liked them that way. When finished, add the cream to the oatmeal and then top with the leeks and serve with the beef. Beef which has been steamed can be used both roasted in a dish and also braised in a sauce, provided that, as soon as it begins to give off a smell, you put the meat in some water. Boil it in as much fresh water as suits the size of the portion of meat; you should not have to add any more water during the boiling. When the meat is cooked, put in a casserole about half a cup of sharp vinegar, some leeks and a little pennyroyal, some celery and fennel, and let these simmer for one hour. Then add half the quantity of honey to vinegar, or as much honey as you wish for sweetness. Cook over a low heat, shaking the pot frequently with one's hands so that the sauce coats the meat sufficiently. Then grind the following: 50 pepper corns, 2 grammes each of costmary and spikenard, and 1.5 grammes of cloves. Carefully grind all these spices together in an earthenware mortar with the addition of a little wine. When well ground, add them to the casserole and stir well, so that before they are taken from the heat, they may warm up and release their flavour into the sauce. Whenever you have a choice of honey or must reduced either by a third or two-thirds, add one of these as detailed above. Do not use a bronze pan, because the sauce tastes better cooked in an earthenware casserole. FYI, The bowl and its lid are American woodwork –– about 250 years old. The statue is a Chinese dragon from about the same vintage. Best I could do from my prop stock to give a Medieval flavor to the visuals~! If you want the classic St Patrick's corned/spiced beef, visit me HERE to get a from scratch recipe! Fascinating post! To console ourselves in the Middle East we often thought "heck the Europeans had their dark ages, now it is our turn". Amazing that you found this recipe and your encyclopedic knowledge is terrific! I love the photos too with the stew in this clay vessel and the figurine next to it, perfect atmosphere. This honey sounds intriguing and I will hunt it down. Now this is QUITE the St. Patrick's Day Feast! No green shakes here! I'm hoping there is a return to the warm medieval spices and seasonings - when I see fennel, ginger, honey and cloves in the same recipe I get all misty-eyed! LOL, I've never had a Medieval beef stew before, but I am looking at the ingredients and I can tell it is beyond lovely. I see some of my favourite flavours in this stew, and I just adore it when savoury is combined with a touch of sweet. 'm doing a give away on my blog for $80 Amazon gift card :), do stop over and enter! Such a wealth of information..detail..etc..
And the dishes you make and photo always suit the style so well..
For sure one of the best beef stews ever. That was one lucky man with a metal detector! What beautiful treasures he found. Such interesting background to all of your recipes! What a lovely treasure your beef stew is too. The recipe sounds truly delicious! Second, your medieval beef sounds and looks extremely rich and wonderful. I love that it has honey and vinegar-that's so authentic. Ooh, and those steel cut oats are awesome! You know I love those. Such a peasant I am. Hope you have a great weekend, Deana, and thanks for an awesome read. So I think I'm going to find about beef stew, but first I learn that the leprechauns leave their gold in England, not Ireland. No wonder the Irish all drink! They never can find the gold! Great story and pictures. Deana, I just adore how you always go all out for your posts. The detail is amazing! And I meant to ask you, have you heard of Bompas & Parr the Jellymongers? They're very much into history too. I saw them speak today and thought of you! The beef dish is a must try. The sweet-and-sour flavors with spices, yes, very medieval. And I love how you pack your posts with history and folklore and gorgeous photography. The gold is magnificent...as is your beautiful stew! In the morning I post my blog. I drive out to grocery shop while I listen to NPR to "The Splendid Table" with Lynn....Casper I believe her name is? I come home to see my comments and see your beautiful comments. I come to see you and I am IN AWE EVERY TIME. Absolutely love learning about Irish history, have a historical fiction about St. Patrick waiting for me to read very soon! This medieval-style beef stew sounds amazing! Very intriguing flavors with the addition of honey and vinegar not to mention the pennyroyal and spikenard root which are fascinating to learn about, wow! Sounds wonderful -- and such lovely pictures of the treasures! To read history is one thing, but to taste it is another. Close your eyes and be transported. I'm glad for the current day substitutions you gave us. I'm flat out of pennyroyal and costmary! Love their names. I've tasted many honeys side by side and actually gone into the hives and extracted it. They all taste so different, except for the little Honeybear. He is always the same. Thank you once again for the adventure into the past. I should know better than to come to your blog without plenty of time to "wander" about. I shall be back, with a large cup of coffee, to explore further. I'm fascinated by those wonderful works in gold and I'd love to be a guest at your table for the stew. And, as always, I feel that I've had a museum visit with you. More interesting research! Stew looks great. Not sure I could try the oat risotto. However, having said that, I have some whole grain oats that I made into a risotto type of dish. It is so filling though. Who says medal detectors are a waste of time?? Good heavens, what a find! The best thing about visiting you, Deana, is the historical information that accompanies your dishes. It's such a pleasure to read. The stew is a delight and while I love steel cut oats, not sure I could eat Brotchan Foltchep for dinner! Your posts are always a treat, so beautifully written and the recipes are inspirational. This stew looks wonderful, I'm already wondering how to get all the ingredients in place! Reason # 1,001 that I love you: "I had Italian Forest Honey on hand." Only you! I am actually pretty fascinated with the variety of single source honey flavors, it's amazing and I'm so glad you brought that up. You are such a genius. I love that your dishes are so often equal parts culinary works of art and lessons in sleuthing. This is a real keeper! I'm going to add spikenard and costmary to my list of things to plant this spring. Intriguing. Have you seen The Secret of Kells? It's an animated kid's movie, but very good. Fireplace mantels are manufactured for sale in a multitude of styles which range from modern to antique designs. Different people have different ideas and choices on coffee brewer they want to buy. The only place where the name Aldi's is printed, is at the bottom of the nutrition facts label. Some mounting plates are different; be aware of specific instructions for your unit. I can't tell from this if you have read Anthimus, or only a secondary source that mentions him. What he wrote is not, unfortunately, a cookbook. It is a letter on health from which one can extract a few recipes. hands, and the sauce will well season the meat. You don't have to use a substitute for spikenard any more--it's still available, and the internet makes it easier than it used to be to find such things. Thanks so much for jumping in. You have a wonderful site. This was written so long ago. I have a copy of the Anthimus tract. I am sorry I made light of it being a "cookbook, sort of" and not being clearer that it is mostly a dietary book. As for the recipe, I used Mark Grant's translation. I gave the translation at the end of the post for those who wanted to see the real deal -- my recipe is an interpretation. I could not read the Anthimus in the original language so relied on the translation. Yours is very different. It makes me want to look at it in the original and see how they could vary so much. I was made aware of the differences in interpretations when working with the Yale tablets and found that Botero took many liberties with his translation. as for spikenard -- when this was written, 6 years ago, it was harder to come by and I didn't want people not to make it because they couldn't find it. I did and used it. The recipe is delicious. Using the forest honey made all the difference. Honey bear honey would lose a whole level of flavor. Thanks for including the Grant translation–I must have missed that when I posted my earlier comment. Anthimus says to boil and then simmer, you are frying and then baking. Am I missing something? I gave the original so people could see what it looked like -- it has always been in the article and wasn't added -- I usually include the original with an ancient recipe because I hate people making changes without letting the reader know what was changed. As for the cooking technique, I like the flavor and the look of meat that has gotten a little searing on it. Otherwise it has a gray look. It is my interpretation of the recipe and stated as such. Simmering takes place in the oven or on the stovetop -- i wanted to keep it at a low temp to keep the meat tender-- doing so doesn't encourage scorching on the bottom if you can't be around stirring for the whole cooking time.